Ontology is a blockchain protocol that is focused on resolving issues of trust, identity, authentication, verification, and authorization. Ontology allows public and private blockchain implementation, forming a matrix of the blockchain, therefore making Ontology an ideal platform for businesses and industries. Ontology is also going to connect with other blockchains, like NEO. 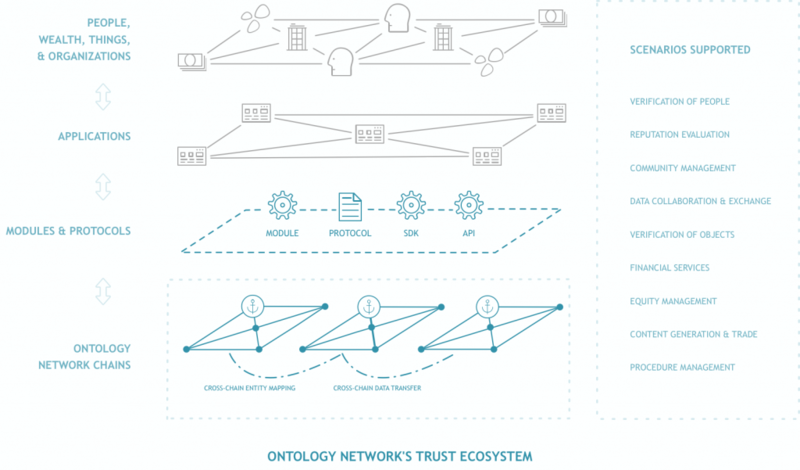 Ontology network provides a platform for secure data storage, hardware options for primary management and also encrypted data analysis. It also provides a framework all types of applications, which includes decentralized data exchange and management protocols via the use of APIs, SDKs, and other modules. Ontology aims to create a trust ecosystem by partnering to provide distributed services that include data verification, data exchange, and lots more across different industries. Ontology can be applicable in almost all sectors including IoT (Internet of Things), finance, insurance, media, software development, payments, medical field, asset titles, and so on. With Ontology utilizing NeoContracts, projects built upon it will enable platforms to create NEP5 tokens (tokens that run on the NEO blockchain). While the Ontology platform itself would serve as data storage and identity, NEO takes care of its asset-based functionality. The first layer helps to verify people, wealth, things, and organizations. The second layer verifies applications and links them together. The third layer verifies link modules, protocols, Development kits and Application Interfaces. The last layer of the chain links different network protocols. With this development, Ontology hopes to be the source for verifying authenticity and accuracy of identities or ownership. Social platforms are then able to integrate with Ontology for trust. It’s notable to mention that ONT never had a public sale where the ONT tokens were purchased. ONT tokens are gotten through airdrops. The most recent ONT airdrop happened when the snapshot of the network was taken on the 1st of March, 2018. Those who had NEO in their wallets or exchanges before the snapshot would receive 0.2 ONT for every NEO held. For every NEO held, token holder gets a 0.2 ONT token and would be distributed twice. 0.1 ONT would be given in the week following March 1 which the snapshot was taken. 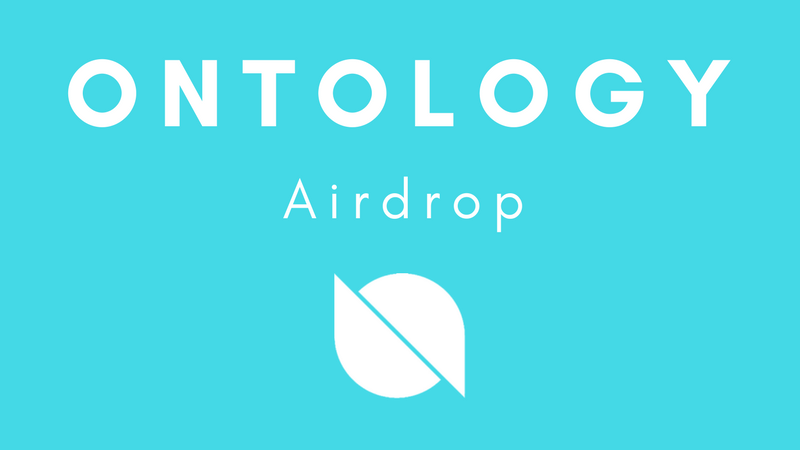 The other half (0.1 ONT) would be allocated and airdropped sometime in the second quarter of 2018 as the Ontology MainNet platform is released. Kucoin and Binance are cryptocurrency exchanges that have allowed their users are claiming the ONT tokens on their platform. To receive ONT airdrop tokens from hence, you should hold NEO tokens in any of the above-mentioned exchanges so as not to miss out of the airdrop. ONT tokens are also best held in non-exchange wallets. However, some wallets display their support for the ONT token while some do not. Notwithstanding, you’ll be able to claim the ONT tokens in wallets that do not display the ONT as well. Neon Wallet can be used to hold your ONT tokens. Individuals who signed up for Ontology’s newsletter were asked to take part in a KYC exercise and received 1,000 ONT. Attendees of the NEO Devcon 2018 who physically handed over their passes with their emails on it to the Ontology booth receives 500 ONT tokens. An email was sent out on February 7, 2018, asking attendees to reply with their ONT wallet addresses. Further instructions are said to be sent later by the team. To follow updates from the team, knowing when next there will be an airdrop, click here. At the moment, ONT tokens are not tradable on any exchange. Word’s out that the tokens would be made tradable when the MainNet launches sometime in the second quarter of 2018. Jun Li is the founder; he’s also the Co-founder of Onchain. He lists himself as the Chief Architect of the project. Julia Yu is the head of the Marketing department for Ontology, and Onchain as well. She is very active on Reddit and also publishes articles on Medium about updates in the community. NEO – ONT tokens is modeled after NEO. Same way NEO holders get the NEO GAS for holding NEO, ONT GAS is also given to holders of ONT tokens.